Apple released the Golden Master (GM) version of OS X Mountain Lion to developers today. The "golden master" designation indicates that this version of the software is intended to be the final version released to the public, barring any last-minute issues. The Build is 12A269. Apple first previewed Mountain Lion in February, highlighting many features already present in iOS, including Messages, Reminders, Notes, Notification Center, Game Center and more at that time. 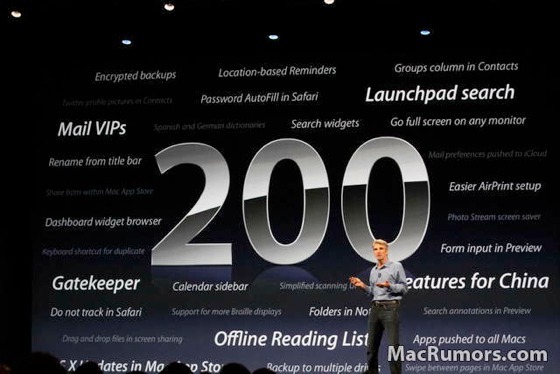 At WWDC, Apple announced additional features, including Dictation, iCloud Tabs, and 'Power Nap'. Mountain Lion will be priced at $19.99 and released to the Mac App Store in July. Can anyone give me a download link please? [SIZE="4"]I'm honestly not that excited about this upgrade. Nothing exciting has really come out since Tiger or Leopard in my opinion. Most of these new features will be used for like 5 minutes by the mainstream user because they're just not that important (i.e. Reminders). And they also end up taking up more precious RAM & most importantly, battery life (on a laptop). Can someone name something that is really that ground breaking in this release? It just seems like things were reorganized & tweaked a bit. Please type larger next time. Just released, 10.8 GM build. *Download the installer from the app store. *Right-click installer -> "Show Package Contents"
*Now open Diskutility and "restore" BaseSystem.dmg to your USB drive. *Copy everything in this folder to the "Packages" folder you created on your USB. Hurray you now have a working installer. *The standard installer will copy the installation DMG to your hard drive and then re-run the installation using that. i.e you are needlessly running the install twice. My way doesn't do that. I wasn't aware it was illegal to ask for a download link to Beta software. I'm new to Apple. It's illegal because the only people who are legally allowed to download the software are the ones who pay Apple for development privileges. Um, why the downvotes? I actually was the one that reported this in the forums, not that it matters, I was agreeing with user Peace :) ? The mod's merged our threads, which is why my comment is here and out of its original place. The timeline/frame of our comments is off because of this merge. Ok, no more "Dr Phil" channeling. I might be silly.... but I'm willing to pay the $19.99 just to get expose "back".